Who doesn’t enjoy shopping? At The Peninsula, an assisted living and memory support community in Hollywood, residents have the convenience of shopping boutiques that come to the community. Several times a week the mobile boutiques unload their merchandise and set up table displays in the community’s lobby. 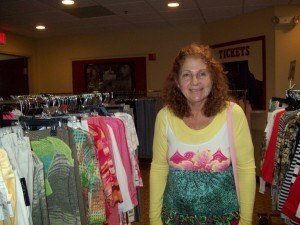 Residents and staff enjoy the convenience of the traveling boutiques. It means they can find beauty products, accessories and clothes without leaving the community. About five different vendors visit throughout the month. At The Peninsula, Barbara & Mel bring handcrafted jewelry while the ladies of Rachel’s Hidden Treasures offer accessories and purses. Rita’s Handmade Jewelry and Organic Lotions bring residents samples and complimentary hand massages. Treats for Soldiers sells beaded jewelry and proceeds benefits care packages sent to the military. The vendors are very patient and seem to enjoy the interaction with everyone.